Here's a troubleshooting guide to help you identify and fix issues with the EngageBox extension. Right click on your page and select "view source." With the source opened, use the search feature of your browser (often CTRL + F) to search for ‘jQuery’ without the single quotes. Paging through the results, look for multiple instances of jQuery.js, jQuery.1.4.0.js, jQuery.1.8.3.min.js, or something similar. If you locate numerous inclusions of jQuery, you have probably uncovered the cause of your issues. Try to find which extensions are making the calls and deactivating them one by one. Once you find the culprit, feel free to email their support team asking them to fix their poor coding choices. Here's a list of things to check when a box is not showing up. Be sure you've set the correct "Access Level"
Be sure you are logged-in as a Super User if "Test Mode" is enabled. Be sure the System - EngageBox Plugin is installed and enabled. Check the Developer Releases section if there's a release candidate available that fixes your issue. Here's a list of known issues that you may experience. If you have plugins installed that use special code (shortcodes) such as Sourcerer or Google Maps and you want to use them within your box, make sure the Content Prepare option found in the extension's configuration page is enabled. In case the shortcode remains still unparsed, you'll probably need to re-order the EngageBox System Plugin before the plugin the parses the shortcode via the Plugins Manager. This behavior is most likely to be caused when the Test Mode is enabled. When Test Mode is enabled, no cookies are stored in the browser to help you test the box faster. Otherwise, you should clean your browser cookies every time you close it to be able to see it again. This problem is probably caused by a Cache plugin such as Page Cache or JotCache. Enabling any of these plugins on your website you are more likely to get random inaccurate Device-Detection results because of the page cache. Try to disable these plugins from the Joomla! Plugin Manager. EngageBox is using Mobile_Detect, a lightweight PHP library for detecting visitor's device type. To avoid conflicts and PHP errors, the Mobile_Detect library is only loaded if it's not loaded by another extension already. However, there are many Joomla extensions out there which don't make this check, as a result, the following PHP fatal error. 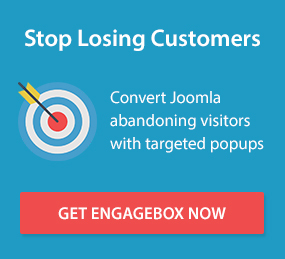 Possible solution: Go to Joomla Plugins Manager and find the EngageBox System Plugin. Then try to re-order it at the end. If the problem persists, please contact the extension's support team and ask them to fix their poor coding. Joomla v3.7 introduced a bug on a mechanism (showOn) which was being used by EngageBox to display vital components like the form fields in the Content tab. This issue affects only EngageBox v3.2.3 and below versions and the solution to this problem is to update to a most recent version of EngageBox. Please be specific as to both the problem and your desired functionality for EngageBox, and provide any URL(s) being discussed. Please be concise. If you have multiple questions or a longer message, consider using bullets or numbers to help keep your questions clear and distinct. Log into your account first and then submit a support ticket through this form.